Flotation standards for sterndrive and inboard powered recreational boats. Monohull Boats (not catamarans, trimarans, or pontoon boats): Mono-hull means that if you can draw a continuous line around the hull at the waterline when the boat is at rest it's a monohull. If it makes two or more footprints in the water it's a multi-hull. This category includes most stern-drive and inboard motor boats. The boat has to float when swamped, (that is; full of water), with some part of the boat out of the water. So how do I know how much flotation to put in the boat? The amount of flotation is based on three factors. 1. The boat weight: that is the weight of the hull, the deck, the seats, etc. Everything not in the next two categories. 2. The machinery weight; engines, batteries, full fuel tank, and controls. 3. The weight of the persons. This comes from the persons weight on the capacity label. Go to page on how to calculate amount of flotation. What do I use for flotation? Most people use polyurethane foam. Some use polystyrene foam, that is, styrofoam. Others use air chambers. Air chambers that are integral with the hull are not allowed. They must be separate from the hull. Also, you have to pass the test with the two largest chambers punctured. Foam is a good solution, but some don't want foam in their classic wooden boats. In that case they can use balsa, or build air chambers into the boat. The two main reasons boats fail is not enough foam, and not enough foam to support the engines. How do I know it works?. The best way to find out if your boat passes is to test it. You can do the test yourself, or have a laboratory do it. However, as of June 2014 the USCG Voluntary testing program has ended. The Coast Guard will no longer test your boat for free. You will have to pay the laboratory to test the boat for you. Call the Coast Guard at or 202-372-1077 to find out about the test program. The Coast Guard still purchases and test boats they suspect are not in compliance and cannot pass the flotation requirements. If this happens you will have to do a recall on all boats of that year and model, so it is better to test it before you start selling them. The maximum weight capacity ( the safe load ) your boat will carry. Cockpit area. 40% reference area. Passenger area 70% reference areas. Two foot reference areas fore and aft. 2/15 of the Person Capacity. 25% of the Dead Weight. 62.4 times the volume of the 2 largest air chambers, if you used air chambers, or puncture and flood the two largest air chambers. With this weight aboard and the boat fully swamped, it must float with some part of the boat out of the water. ABYC H-8.7.3.1.2, SAYS THAT IN ADDITION TO THE ABOVE: “WEIGHTS THAT, WHEN SUBMERGED, EQUALS 75% OF THE DRY WEIGHTS OF THE PROPULSION SYSTEM AND BATTERIES." ABYC assumes you will test without the engines and sterndrive installed. The Coast Guard tests the boat with the engines installed but removes the sterndrive and batteries, and substitutes weights. Initially the boat is flooded with water and allowed to soak for 18 hours. Then the weights for the basic flotation test are added, and if any part of the boat is above the water it passes. Reality: The reality of this test is that with most inboard boats the boat will float with nothing sticking out of the water except the bow. If you can, try to achieve better than that. But it is difficult to provide enough flotation aft to float the weight of the engine. 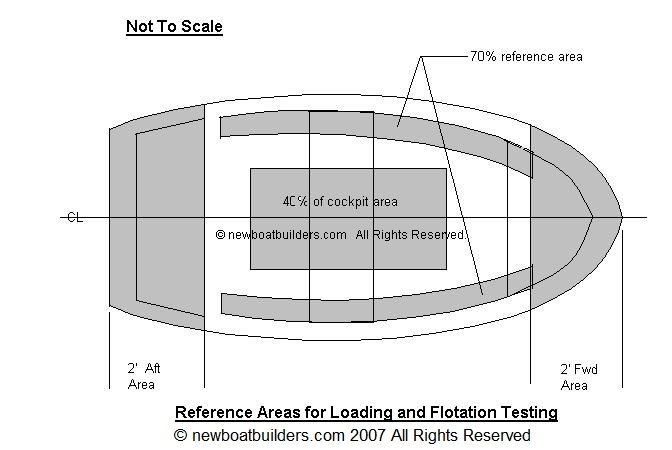 Typically the test tanks are not deep enough to accurately test a boat with basic flotation. So weights have to be shifted around to make the boat float in a more level attitude. Try to install the flotation in the area around the engine. That's It! If you pass all these tests you have done everything the regulations require.